In this tutorial, we’ll look at how to improve your results when using the Photoshop Dodge and Burn tools. The Dodge and Burn Tools in Photoshop are extremely powerful but can also be difficult to use. This is one of the reasons why I also recommend an alternative approach to Dodging and Burning using Blending Modes. Dodging and Burning is a great technique to help inject interest and life into your photography. Even relatively small adjustments with the Photoshop Dodge and Burn tools can create a remarkable improvement. You can see the result of my Dodging and Burning, together with selective saturation increases below. It’s this ability to work on localised areas of an image that gives the technique its power. Dodging and Burning is a technique originating in the black and white darkroom. Primarily it was a needed to add interest to an image that might otherwise look “flat”. Typically, a lot of black and photos would lack contrast and appear lifeless when printed. By Dodging and Burning it was possible to enhance the photos to make areas more prominent and features stand out. By applying Dodging and Burning to selected areas of an image, you can lighten or darken them. When we view a photo, our brains work by subconsciously directing our gaze towards light areas and away from the dark. Understanding this helps to unconsciously direct our viewers’ attention, but there’s more. We also tend to notice differences in tone whilst passing over areas where the tones are quite similar. This is how we detect detail and depth. If the subjects in an image have a similar tone to their background, we tend to ignore them. If the entire image has very similar tones our eyes wander across and out of the frame without anything to hold our attention. By selectively dodging and burning we can add depth to our photos and create separation between subjects. If you were Dodging in the traditional darkroom you would be decreasing the exposure of that area. This usually involved placing an object between the light source and the photographic paper you were exposing. Because there is less exposure in that area, the area would appear lighter in the final print. Burning is the opposite of Dodging and involves applying additional exposure to an area that might otherwise appear too light. 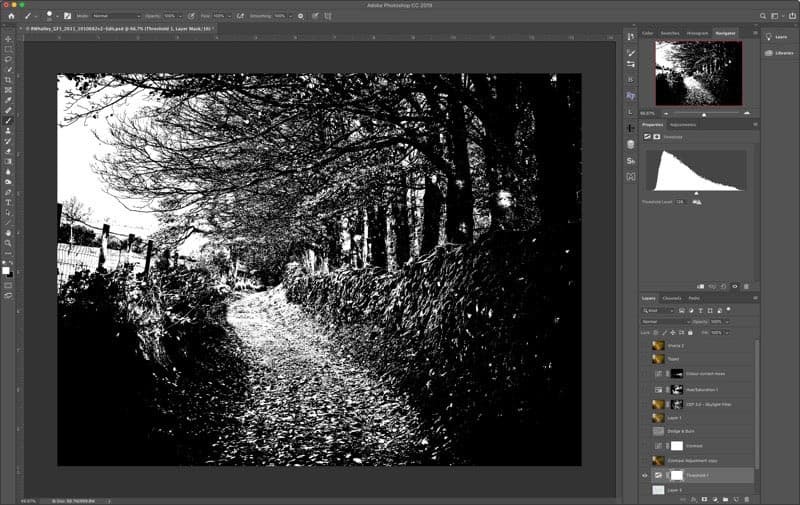 The Photoshop Dodge and Burn tools replicate the darkroom techniques except they are more powerful and much easier to use. They also work equally as effective with colour photos so don’t restrict yourself to black and white. 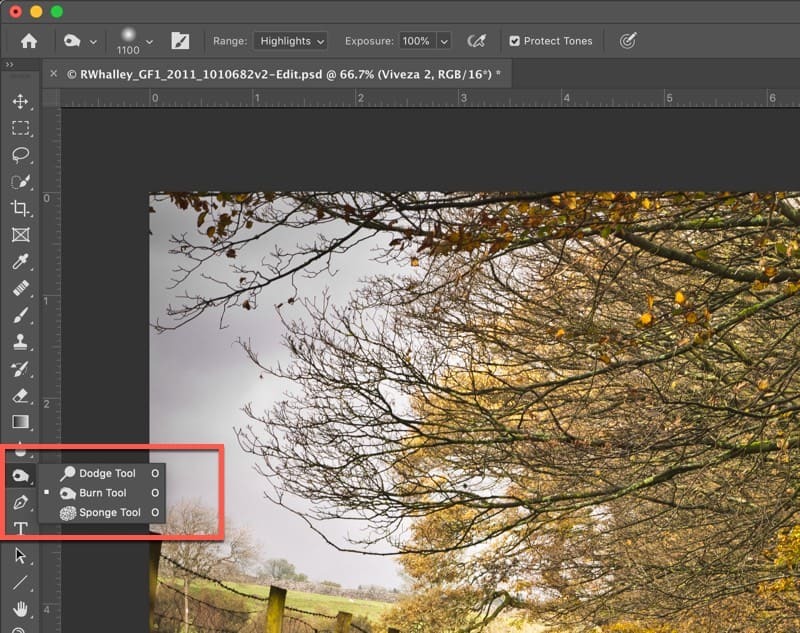 You will find the Dodge and Burn tools in the Photoshop Tools Palette on the left of the interface. You can see them in the following screenshot. The Dodge and Burn Tools are part of a group of three tools in the Photoshop Tools palette, the third being the Sponge Tool. Whilst we won’t cover the Sponge Tool here, it’s used to selectively increase or decrease the saturation of colours. For example, look back to the Before and After image at the start of this article. You can see the colours in the foreground leaves on the path are more saturated in the finished image. The effect’s created by darkening the leaves with the Dodge tool and then increasing their saturation with the Sponge Tool. Depending on which tool you used last, you could see any of the three tools (Dodge, Burn and Sponge) in the Tools Palette. Right-click the current tool in the palette and you will see a popup showing the other tools in the group, which you can select. It’s important to remember the Photoshop Dodge and Burn Tools are a type of brush. The Burn Tool allows you to darken areas of your image. The Dodge Tool allows you to lighten an area. When you select either tool, you see the controls in the Context Sensitive toolbar along the top of the screen. There’s a screenshot of this below. It’s possible to configure the Dodge and Burn tools and then save that configuration as a Tool Preset using this dropdown. Once you’ve created a Tool Preset it becomes available in the list for future use. This is where you can configure characteristics of the Brush like the Size and Hardness. There are also other much more advanced settings you can access here such as changing the shape and direction of the brush tip. For most dodging and burning a regular soft, round brush works well. The Range dropdown allows you to target the tonal range you want to affect with the brush. You can select from Highlights, Midtones and Shadow tones. When you paint with the Dodge and Burn tools, you only affect the selected tonal range. Exposure controls how strong the effect is. The higher the value the stronger the effect. Clicking this icon will toggle the airbrush effect on and off. When the airbrush effect is on, the adjustment builds up gradually on an area until it reaches the value set by the Exposure slider. This can help with blending the effect but personally, I tend not to use it. It’s often better to paint with a single brushstroke. When you Protect Tones, you prevent the Dodge and Burn tools from affecting the saturation of the image where they paint. For example, if you use the Burn tool to darken an area you will also increase the saturation of that area. If you click the Protect Tones option, the Burn tool won’t affect the saturation. This is a pressure control option if you are using a graphics tablet with a pressure sensitive pen. The best approach to using the Photoshop Dodge and Burn tools is to first create an editing plan. You can do this by sketching out a line drawing of your photo and then deciding which areas you want to darken or lighten. For each of these, decide if you want to target the effect onto the highlights, shadows or highlights. This may initially appear time-consuming but it’s a great help in understanding how to improve your photo. You could also do this by drawing onto an empty layer in the image as shown below. When Dodging and Burning an image, think about how you want to direct the viewer’s attention. 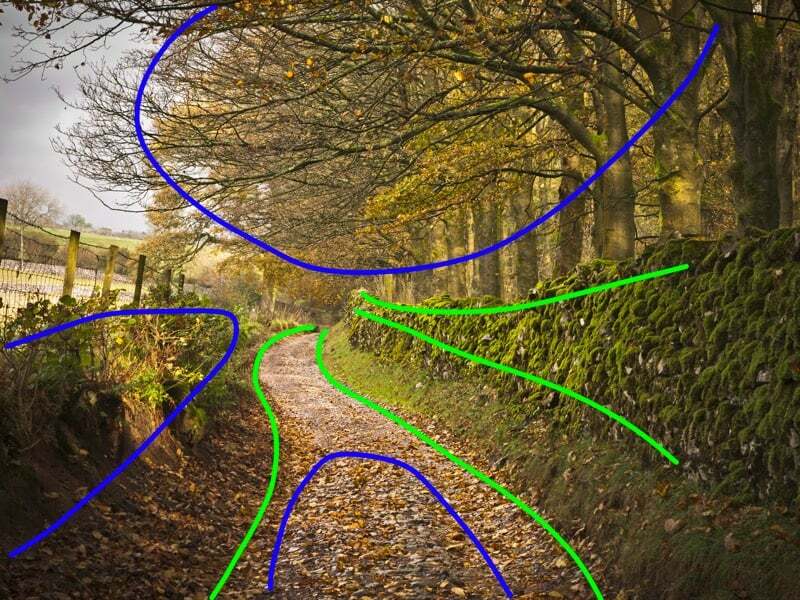 In the example image above, I want to emphasise the shape of the path by lightening it as well as the wall, but these areas are already quite light. It might, therefore, be better to draw around these areas with the Burn Tool to darken the edges. This makes the path and wall appear darker. The other technique we can use is to darken the outer areas of the frame (shown outlined in blue). By darkening these areas, it helps to draw the viewers attention into the image and prevents it from wandering out of the frame. It can also help to intensify the colours in those areas when we make them darker. To get the most out of the Photoshop Dodge and Burn tools there are three further tips I want to share with you. It’s best to apply the Photoshop Dodge and Burn tools using a copy of the image layer. These tools are what we describe as destructive in that they directly affect the pixel of the image. If you want to adjust them in a future editing session you won’t be able to. Using the tools on a separate layer also allows you to control the effect by changing the layers Opacity and Blending mode. The best way to create a new layer for Dodging and Burning is using the keyboard shortcut Shift + Ctrl + Alt + E. If you’re using a Mac that’s Shift + Option + Command + E. When you press these keys together you will create what we call a “Stamp Layer”. This is like taking a duplicate of all the visible layers in the image and flattening them into a new layer. Just be sure that you click on a visible layer at the top of your Layers Window first or the keystrokes may not work. The default strength of the Photoshop Dodge and Burn tools are far too strong. If you use them at their default strength you will most likely damage your results. A good starting Exposure strength for the tools is between 3% and 5%. This allows you to build up the Dodging and Burning effect slowly and more naturally. It’s quite easy to overdo the Photoshop Dodge and Burn tools. This can cause areas of your image to become pure black or white depending on the tool you are using. This can look ugly and is often difficult to detect whilst you’re working. You only tend to notice the problem when you return to the image later. A useful way to check if you are losing detail is to add a threshold layer to the top of your image layers in the Layers Window. You can do this by selecting “Layers | New adjustment layer | Threshold...” from the menu. When you do this, you will see a black and white version of your image as shown below. You can then move the adjustment slider in the Properties window left and right. As you move the slider the display changes to show the pixels that are lighter or darker than the slider setting. The darker pixels show as black and the lighter pixels white. The two values I suggest you check are 8 and 249. When you set the Threshold slider to 8, look for large areas that are darker than this. If there are, you have probably made these too dark and/or you need to avoid darkening them further. Use the slider value of 249 to look for large areas of white. Whilst these values of 8 and 249 aren’t pure black and white, they are sufficiently dark and light to appear like that on a screen or in a print. When you finish checking the threshold levels, click on the eye icon to the left of the layer in the layers window to turn it off. You can then continue working on your image until you want to check it again. The Photoshop Dodge and Burn tools are very powerful and flexible. They can though be tricky to use, especially if you apply them with their default settings. The advice in this tutorial should help you achieve good results when used with most photos. And don’t forget, you don’t need to just use them with black and white images. They can produce great results when applied to colour images too. An alternative to using the Photoshop Dodge and Burn tools is to use blending modes. My alternative Dodging and Burning tutorial with video explains how you can do this to great effect.